The Vizsla is not found with any markings. 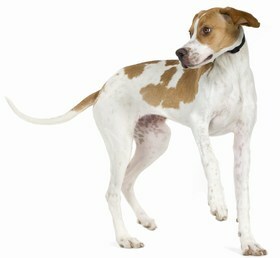 Epilepsy exists in the breed, as does lymphosarcoma and various skin issues. Lively, loving and gentle – the Vizsla, or Hungarian pointer, makes for a versatile hunting dog as well as a loving companion for active families. Bred to be a “walking gentleman’s shooting dog”, Vizslas spent hours upon hours in the field, and this energy level remains very much a part of the breed. 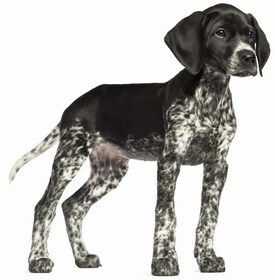 They possess an interesting mix of characteristics; they are a pointer that also has some retriever qualities. Athletic and light on their feet, Vizslas need a large fenced yard to romp in, but this should not be their only source of exercise, nor can they live outside. They have considerable exercise, mental stimulation and companionship needs, without which they can become neurotic, hyperactive and destructive. A minimum of one to two hours of vigorous exercise each day will keep everyone’s sanity. Vizslas also love to chew, so it behooves their owners to supply them with a variety of chew and interactive toys. Vizslas can make fine companions for active families, but their exuberance can be overwhelming to younger children, so older, active children are usually a better match. Generally Vizslas get along well with other dogs, but cats and small animals are at risk. While polite and friendly to strangers, the Vizsla makes a good watchdog. In fact, some can be barkers, and it is common for a Vizsla to “talk” to their people with various whining, moaning and groaning. “Velcro Vizslas” describes this breed’s insatiable desire to be with their people. Too much time alone and no job to engage in are the most common reasons Vizslas lose their homes. Vizslas will chase small animals, so for their safety, must always be leashed unless in a fenced area. Some people have been successful with a Vizsla in an apartment setting, but you should have places to exercise your dog close by, and remember this dog must have his exercise every single day; once these needs are met, Vizslas can be very cuddly. Although more challenging, a Vizsla would be far better off in an apartment, getting sufficient exercise and stimulation, than being left alone in a large yard. Vizslas need early and ongoing socialization to counter the tendency of many to be wary of strangers and novel experiences. Socialization should begin in puppyhood and continue through the age of two. The unique combination of pointer and retriever attributes make for interesting training; while Vizslas do have some of the pointer’s independent nature, they tend to be more willing than most pointing breeds. You will experience the best results using positive reinforcement methods; harsh and highly punitive methods will likely shut down your Vizsla. This breed is versatile not only in the field, but also in activities; they make for a versatile hunting dog, a jogging partner, and a fine companion for active families. Jogging or running should not begin until growth is complete (~ two years) so as not to cause joint damage. 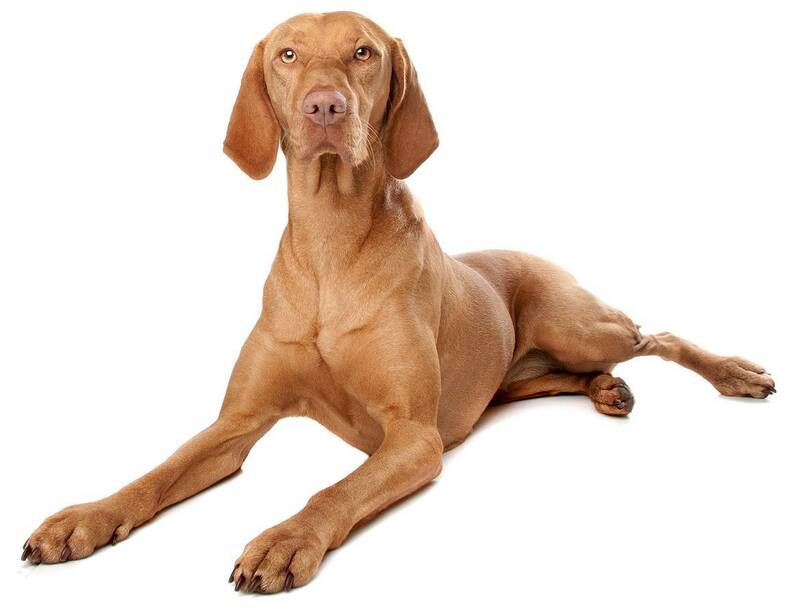 The Vizsla’s coat is short, smooth and dense. 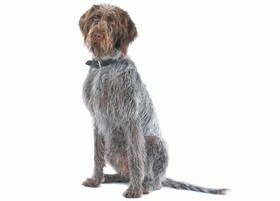 The smooth coat is the only type recognized by the American Kennel Club, but there also exist a wirehaired variety, a longhaired variety, and even a woolly. The smooth coat is easy to care for; since dirt falls off, they stay very clean with little work. Bathing can be done, as needed, but most owners just use a damp rag to freshen up their dogs. Weekly brushing with a curry or soft bristle brush will keep the normal shedding to a minimum. During spring and fall, the coat will “blow”, allowing new coat to come in; during these times, shedding will increase dramatically and brushing more frequently will lessen the hair falling in your house. Ears should be kept clean and dry. Toenails should be trimmed; even if your Vizsla wears their nails down, you will want to maintain the ability to handle their feet, especially useful as they age, when wear to the nails typically slows down. Teeth must also be checked and cleaned regularly. The amount of food a Vizsla will require can vary depending on age, activity level, and type of food fed. On average, Vizslas will eat 3 – 4 cups of food, fed in two meals per day; a high quality food should be fed. Free feeding should be avoided. A constant supply of fresh, clean water must always be available. Prices for Vizslas vary widely, running from the $600-$1,000 range on up to $2,000. Breed rescue organizations are another option, where lovely dogs needing a home can be found; adoption fees vary widely, but are generally in the $200-$500 range. Whether you acquire a dog from a breeder or rescue, do your homework to be assured that the temperaments of the dogs are tested and sound. 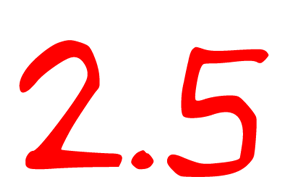 Ongoing expenditures include the typical supplies, food, and regular vet visits. Ranking takes into account a few basic factors such as cost, skill level needed, high vs. low maintenance, and how critical regular training is to success. 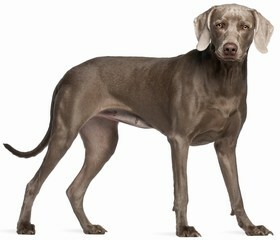 The Vizsla rates a 2.5, primarily due to their very high need for exercise and activity.